I know I say this every time I do an Educational Insights Review but I seriously LOVE their products. They never disappoint and today's review has me all kinds of excited! I have been dreaming of getting my hands on their Teaching Tiles Early Learning Tiles Reading Readiness Center for awhile. I had visions of fabulous hands-on manipulatives and activities that would help foster the Lil Divas language, vocabulary and reading skills. Those dreams came true when this package arrived at our front door! So why has this Mom/Teacher been pinning over the Teaching Tiles Early Learning Tiles Reading Readiness Center? Take a peek at the learning manipulatives and activity cards inside this box. Pretty drool worthy, right? *1 plastic work tray which is tilted for easy tile positioning and viewing and has a built-in ledge to hold the activity cards in place. *100 plastic tiles (26 uppercase letter tiles, 26 lowercase letter tiles and 48 picture tiles). The tiles are color-coded to match the activity cards. This means that students can easily determine which tiles they need for their activity - perfect for some independent learning! *50 self-checking activity cards (more on these below) Each card is color coded to match the tiles, has a skill-building activity on the front and the solution to the activity on the back - this makes independent learning possible even for non-readers. What skills are covered in the activity cards? matching pictures to their opposites and matching pictures that go together. These cards were perfect for my preschooler. She found them fun and has requested to do them again more than once. I found they were just challenging enough. 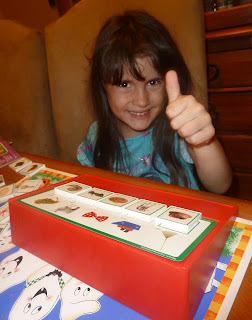 Of course after repeated use, she has the answers memorized so I've changed up how we use the tiles (more on that later). 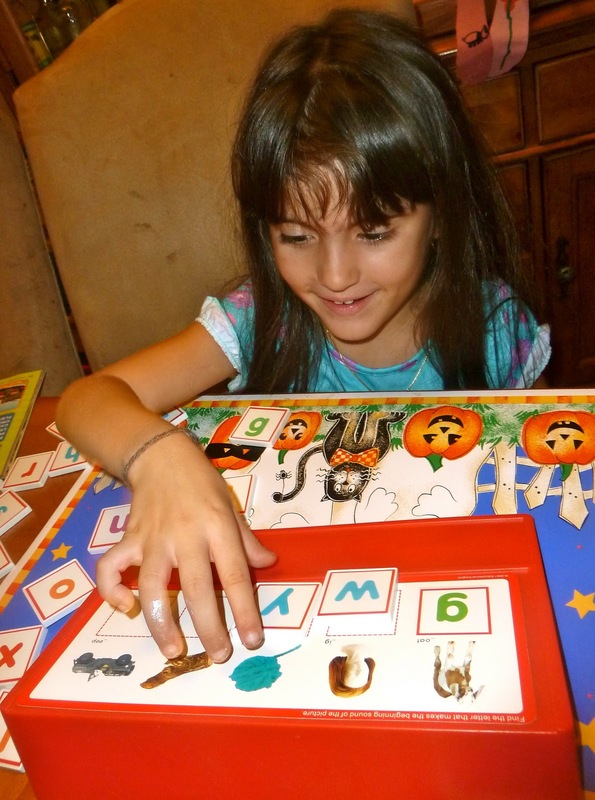 The blue cards provide alphabet recognition practice through the matching of upper and lower case letters. 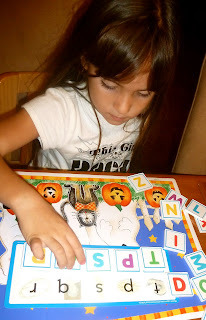 The Littlest Diva did great with these - they were easy for her so I incorporated having her practice the sound each letter makes as she placed the tile on the card and then later, even added having her give me examples of words that begin with that letter/sound. I like how you can build on the activity cards to suit your needs and/or child's abilities. sequencing the letters of the alphabet and lower case letter matching. The Lil Divas enjoyed the activities and they caught on very quickly with how to use them. This is fabulous for at home use but it would also be ideal to use in a Pre-K or K (for the beginning of the year) classroom as a independent or teacher directed center. I especially like the many possibilities for extending how the Reading Readiness Center is used. The letter tiles can be used for ABC order activities, alphabet games and alphabet matching games (match lower to upper case letters). 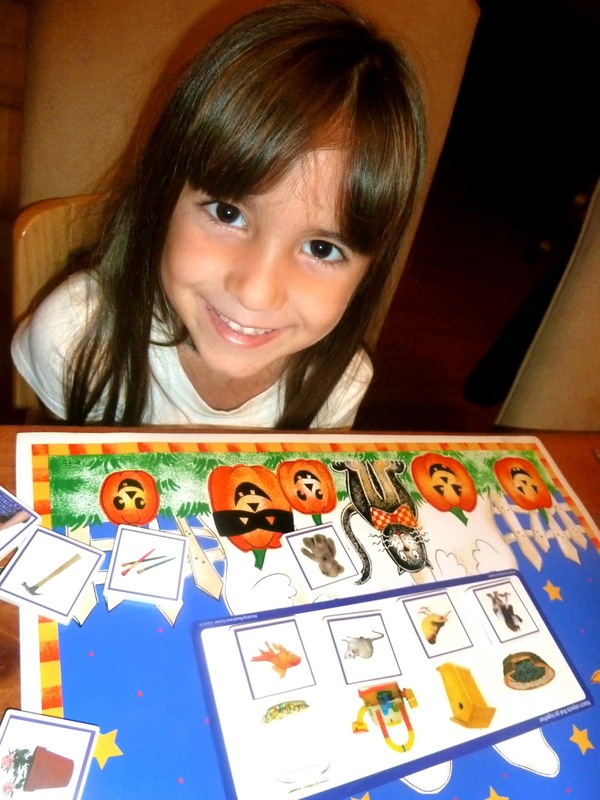 The picture tiles are great for beginning sound and rhyming games. 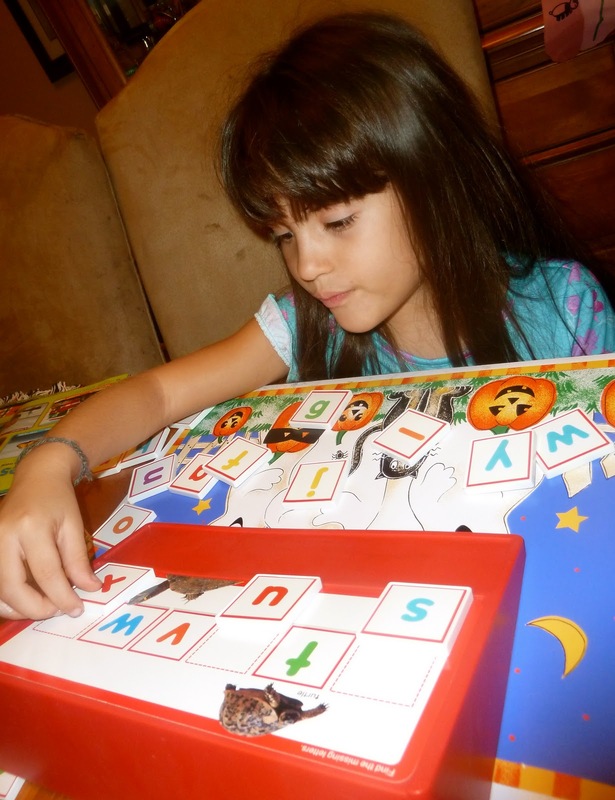 The set can even encourage beginning spelling and story telling. So many possibilities! I am so excited that we have this wonderful resource at our disposal and I am so happy to be able to share it with you thanks to the generous people over at Educational Insights hosting a giveaway for the Reading Readiness Center here at Mom to 2 Posh Lil Divas Blog. (Retail Price = $49.99) on Educational Insight's website. here on Mom to 2 Posh Lil Divas Blog. To enter comment below and tell me why you would like to win the Reading Readiness Center. Please include your email w/your comment so I can find you if you're our winner. I'd love for you to Follow Mom to 2 Posh Lil Divas Publicly via Google Friend Connect - join all the fab posh followers! You know you want to! I'd love for you to join my growing Mom to 2 Posh Lil Divas community on Facebook - I love to chat & share ideas there! Follow Mom to 2 Posh Lil Divas on Twitter - let's tweet & keep connected! I always share fun ideas there. Subscribe to Mom to 2 Posh Lil Divas emails - This would ensure you don't miss a thing going on here & really why would you want to miss a thing?! Comment on any non-giveaway post on Mom to 2 Posh Lil Divas Blog and leave a link. You can do this for up to 3 posts but please note that comment must be dated after the start date of this post - not valid on previous comments. Disclaimer: I received the Reading Readiness Center for free from Educational Insights for the purposes of trying it out for this review. That being said, this review is my 100% honest opinion of this product - I am not paid for my reviews or optinions! They are 100% mine! Please remember that your opinions and tastes might differ from mine. Would also love this for homeschooling! I love how you were able to build on from what they have to grow with your children! I also follow your blog...publicly! ...and I visited(like) educational insights on facebook! I'd love a chance to win the educational tiles! I've recently become a SAHM and this looks like a perfect resource to use with my kids! Thanks for the chance! What a fun way to learn. This would be great for our homeschool. i'd like to win it for my niece for her to learn english! I would like to win because we are homeschooling out 4 and 6 year olds! Step 2 complete. I follow you on FB. I would love to win this for my son who is in kindergarten, it would be a great addition to our phonics lessons! I would love to win this! I care for my grandson and this educational tool would help me work with him on reading readiness. I would like to win the Reading Readiness Center for my nearly 4 year old. He is behind in learning and I've been trying to work with him, but it's been difficult. I'd love to win this to help get him even more excited about learning his letters and how they can make words, etc. Thanks for the chance! I follow Mom to 2 Plush Divas publicly via GFC. I follow you on Facebook as Laura Waltz. I like Educational Insights on Facebook and let them know I was coming from you. I commented on your blog post. I love those ghosts; totally going to have to do it soon! I would love to win this for my 2 little granddaughters. It looks like a wonderful teaching tool for beginning readers. Thanks for review & giveaway! I am a kindergarten teacher and would love to win this for my class. I went to Educational Insights facebok page as well. I have 2 daughters who would benefit from this. One could putt words together and the other to learn her letters. Following via GFC as Mamas Like Me. I would love to win this! My son just started Kindergarten and is trying to learn how to read...this would make learning to read a lot more fun. I also started following you on FB. This would be a great tool for our homeschooling! I would love to win this for my 4 year old. From what his teachers have told me in the past he may have some type of learning disability or it may be just plain laziness! Either way he is not in school now and I've noticed that unless it's not Fun...he's not interested...but only with me :( This way I can make it not only educational but fun for him as well. I would love to win this for my daughter. I like that this makes learning fun. I would use this in the classroom! I like (LOVE) E.I. on Facebook. I agree that their site is awesome. Customer service is amazing too! I submitted my guess for the Estimation Station. We homeschool and would love to add this this to our day! My little guy has recently started to show a great interest in reading on his own. This would be such a fun tool to help him learn! I "like" Mom to 2 Posh Lil Divas on FB. thanks for another great EI giveaway! I visited Educational Insights over on Facebook and told them you sent me. Though I couldn't find the penny guess contest. Wondering if it is over. My daughter is almost old enough to read and I would love to have this as a tool! I'd love to win it for my son who I'd like to teach to read and I think it will make it easier. I like Educational Insights on Facebook. and posted on their wall. I would love to win these for my son. We are starting the home school thing and know this would help with his reading and spelling. I would like to win this for the little girl next door. Would love to win this for my daughter. She is just beginning to be interested in letters and reading. I would love to win because I am starting home Kindergarten with my soon to be 4 year old in December.